The echo of students' voices throughout a huge warehouse marked the kick off of manufacturing day at the Oregon Manufacturing Innovation Center in Scappoose. 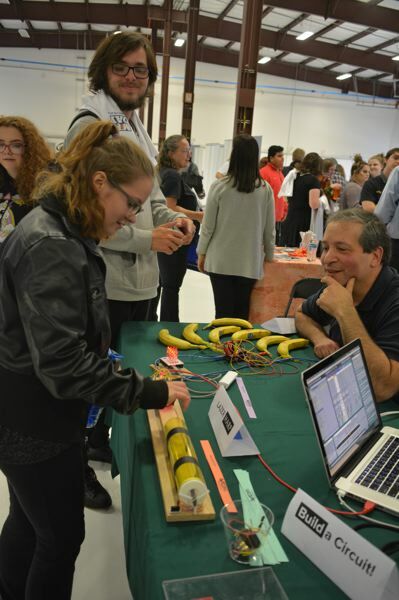 The research and development site hosted several groups of classes, county residents, vendors and U.S. Rep. Suzanne Bonamici Friday, Oct. 5, for the first-ever Makers Gone Pro West event hosted at the center. 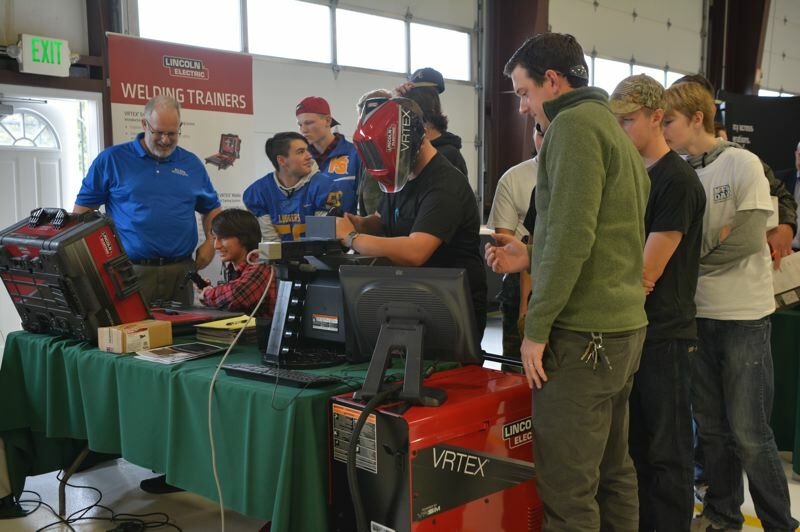 Students from St. Helens, Rainier, Scappoose, and even Knappa high schools wandered around the site, stopping at vendor booths to check out a Boeing flight simulation display, an industrial milling machine, cutting tools and welding and spraying simulation software. Matt Kreins, a Scappoose High School freshman, stopped at a table hosted by Insitu, a subsidiary of Boeing. Kreins stood in awe of a model plane that used replica parts of actual Boeing planes. Nearby, 10-year-old Jaden Rice stood before one of OMIC's benchmark pieces of equipment, the Millturn M80. Rice appeared minuscule next to the $3 million machine, watching as automated doors opened and closed, revealing a tool for boring and machining that spun and swiveled like the arm of a robot. Makers Gone Pro introduced students to hands-on tools and programs used in the manufacturing industry, while also offering general members of the community a chance to check out OMIC and get a sense of the companies fueling the future of Columbia County's manufacturing endeavors. 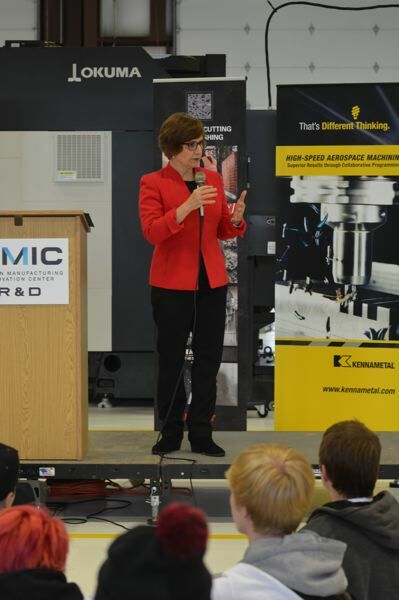 "I'm thrilled to be back at OMIC," Bonamici told visitors during a brief speech last Friday. "Every time I come back here, there are more developments and more opportunities to learn." At a booth toward the far end of the R&D warehouse space, two students from different schools sat side-by-side as each tried their hand at simulated welding and paint-spraying via virtual demonstrations done with a computer system. At the end, each received a score, with a free welding helmet given away as a prize to the person with the highest score. Several students from St. Helens High School's CTE program were on-hand as aids to guide visitors, assist at vendor booths and answer questions. "It's cool to know all this stuff is right here near our community," Ryan Brindley, a St. Helens senior, said. The proximity of the world-class advanced manufacturing center is not lost on the high school student, or hundreds of other visitors who stopped in Friday to tour the site. For senior Mariya Hawkins, the program provides a fulfilling chance to experiment with a potential career field. "I love working with my hands," Hawkins noted. "I love being able to touch something and learn how it was made." Hawkins and fellow CTE student Gage Lewno say they've even made their own machine parts in the class when needed. "A lot of people in the metals program end up going into manufacturing," Chris Marsh, a senior at SHHS, noted. To date, OMIC has gained paid partnerships with more than 20 companies in the manufacturing industry and secured more than $15 million in state funding.